2019 Calendar from Adam Wa Mishmish for children. It helps them learn the months in the arabic langu..
Pre-K flashcards contains 26 giant shaped flashcards designed to help children learn a variety of fi.. The best-selling Soft Shapes® series introduces new titles with a brand new look kids will love! Mad.. This series of stories is a collection of words, pictures and questions for kids. The series aims to.. This series of stories is a collection of words, pictures, and questions for kids. It aims to educat.. Number of pages: 18 ..
Board book Publisher: LADYBIRD (2009) Product Dimensions: 9.5 x 0.4 x 10.3 inches Shipping Weight..
Get ready for Pre-K in this colorful wipe-clean workbook from Scholastic Early Learners! ..
With vivid photography of animals and fun, slide-and-find pictures, children will love exploring..
Flashcards 123 helps children learn their numbers in a bright and interactive way. The set contains ..
An exciting new series of early learning velty board books that combine Scholastic's strength in lea..
Touch and Feel ABC is an interactive ABC book for very young children, with touches to feel and flap.. This sturdy board book with soft, plush bee antennae offers a playful and interactive way to remind .. In This Advanced Reader, Students Work To Save A Local Bat Habitat From Being Destroyed. Teaching Fo..
Board book,Have fun learning what noise a duck makes with colorful illustrations. T..
Presents the familiar nursery rhyme..
Presents the familiar nursery rhyme ..
A little mouse runs up a clock, only to run down again and surprise the the inhabitant of the house,.. Enjoy A Timeless Classic Nursery Rhyme. Correlated To Common Core, Texas TEKS, Virginia Sols, And Ge..
Photographs of familiar objects introduce words for vehicles, clothing, tableware, and soft toys. ..
Illustrations and simple text show how a race car participates in an automobile race. On board pages..
Adam Wa Mishmish is an educational cartoon created for children to learn and love the Arabic languag.. This smaller Baby Touch book gently introduces key early learning concepts using the bold, distincti..
Part of Ladybird's best-selling Baby Touch series, Baby Touch Tummy Time is an innovative, colourful.. This gorgeous, ribbon-tied Sophie the Giraffe keepsake book is perfect for new parents. Record baby'.. This board book for babies introduces the first concepts of time with familiar events that structure..
A companion to the beloved tabbed board book haiku baby–this one celebrating the wonders of nighttim.. The “Arabic Nursery Rhymes Gift Set” is the complete set of 32 popular Arabic rhymes put into 3 beau.. The complete gift set of 34 stimulating Arabic rhymes put into 3 beautifully illustrated board books.. The best-selling Soft Shapes series has a brand new look kids will love! Made entirely of child-safe.. 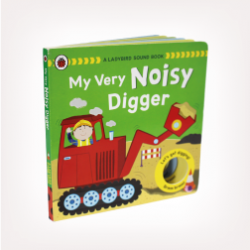 Finally, early-learning concept books with pages that children can turn all by themselves! Created w..
"The Ladybird First Words and Pictures" series is perfect for helping your toddler's develop early v.. This is a wonderful first lift-the-flap book - Peekaboo Moon from Ladybird. Peekaboo Moon is a lovel..
Peekaboo Moo! is a lovely first lift-the-flap book for babies and young toddlers. Turn each page to .. Follow Builder Barney as he works on the busy building site. From checking the plans and laying foun..
About the product: Give your child a head start on their first day of school with this fun-filled, ..
"Ayn" the regions first wordless lift-the-flap board book! As you thumb through your very own copy, .. Turn the pages to mix & match characters Pages crinkle, squeak and include a baby-safe mirror ..
Includes 6 pages and over 10 developmental activities Hide-and-seek pocket owl Peek-a-boo flap Mu..